Matthew Kenworthy has posted a few things from the recent Beta Pictoris meeting under the hashtag #NiceBetaPic. Maybe something seen in the ultraviolet during the Hill Sphere transit? The giant planet that revolves around the Beta Pictoris star has just been photographed again thanks to the VLT. A rich observation of information on this neighboring planetary system. Since November 18, 2016, no one had seen the gaseous planet that revolves around the Beta Pictoris star, 63 light years away from the Solar System. That month, Anne-Marie Lagrange, of the Laboratory of Astrophysics of Grenoble and discoverer of the planet in 2008, had taken the last photo before it drowns in the light of its star. Indeed, Beta Pictoris b (this is her name) follows a trajectory in a plane that leads her to pass almost in front of her star. In November 2016, she was getting closer and closer to this conjunction expected by astronomers. Thanks to the SPHERE (a camera with powerful adaptive optics), installed on one of the 8.2 m telescopes of the VLT, in Chile, Anne-Marie Lagrange found the planet on September 17, 2018, the other side of the star, as expected. The reappearance of the planet 13 times the mass of Jupiter on the north-east side of the star made it possible to specify its orbit. Until then, there were several solutions to extrapolate its trajectory. One of them supposed a rather eccentric orbit that would have covered in more than 30 years. This one is now eliminated. Astronomers know that the gas giant they saw for the first time in 2003 (for an effective discovery in 2008) is at 9.2 astronomical units of its star and that it follows a little eccentric orbit, at image of Jupiter or Saturn. She curls it in just over 22 years. About 15 years have passed since the first shot of this planet. She was spotted for the first time on the northeast side of the star. Then she had been seen on the southwest side, after passing behind the star. However, it is only since 2014 that astronomers follow it with great precision thanks to SHPERE and that they have better data to specify its orbital parameters. This new image of Beta Pictoris b brings a decisive light on an event expected by astronomers and ... which did not take place: its transit in front of the star. There was indeed a small chance that by passing between its star and the Earth, the exoplanet transits in front of the stellar disk. In the light of the last observations, astronomers did not believe it too much, but they thought that they would see the passage of the environment close to the planet in front of the star. This environment has a scientific name: it is the sphere of Hill. It is a spherical volume of about 150 million kilometers in radius in which the gravity of the planet governs everything. This is where there are potential satellites but also that the space has been cleaned of all the dust. However, dust, the neighborhood of Beta Pictoris is filled, to the point that astronomers observe the star through a permanent veil. Therefore, if the sphere of Hill passed in front of the star, this should result in an increase in brightness of the latter due to a matter deficit that would have accompanied Beta Pictoris b. The appointment was taken. Between the end of 2017 and the end of 2018, something had to happen. Astronomers have mobilized a telescope at the South Pole, A-Step, to continuously monitor the brightness of the star and note any increase. A micro-satellite, PicSat, has even been launched with the aim of providing continuous surveillance from space. Alas, after a few orbits, the craft stopped working. Luckily, a telescope located in South Africa, but also a mini-constellation of five cube-sat, Brite, were in the breach. The Hubble telescope has also been pointed occasionally towards the star. Result? "We did not see anything except the natural oscillations of the star, which is a delta Scuti variable," says Tristan Guillot, astronomer at the Côte d'Azur Observatory. The brightness of Beta Pictoris varies by 0.5% every thirty minutes. The A-Step telescope detects it well. As for Hill's sphere, it remains for the moment undetectable. However, the analyzes of the observations are just beginning, as Anne-Marie Lagrange reminds us: "We can not exclude anything for the moment. It is difficult to judge the photometric stability of the star (note: keep a stable reference on the measured brightness) over such a long period. In other words, only the meticulous expertise of the data accumulated by the various telescopes will make it possible to say whether or not the Hill sphere actually passed before the star. However, it is possible that astronomers have detected by another means the passage of the planet close to its star. "During the supposed transit, we detected a greater cometary activity than usual, continues Tristan Guillot. Indeed, the presence of comets in this young system is no longer a mystery for years. As early as the 1980s, the spectral signature of comets falling towards the star and passing in front of it was observed and its evolution followed frequently since. Is the increase in cometary activity due to the position of the planet at this time? Again, difficult to say. A glimpse of the magnetosphere of the planet? For Alain Lecavelier, astronomer at the Institute of Astrophysics of Paris (IAP) and long-time specialist of Beta Pictoris, "Something has happened. During the transit of the Hill sphere, we observed variations in spectroscopy (note: the light of the decomposed star to measure velocities, temperatures and the presence of elements). We have identified the presence of neutral hydrogen and ionized oxygen. For the researcher, this can come from variations on the surface of the star, but also from the passage in front of the star of a comet family. There is also a third hypothesis: a conjunction between the star and the Hill sphere of the planet. "We spotted the ionized gas signature during transit," says Tristan Guillot. Is there a stellar wind whose particles recombine with the magnetosphere of the planet? This is for the moment only a preliminary track. Extensive work must be done to verify it and, if necessary, confirm it. The transit of Beta Pictoris b in front of its star was expected for another reason. In the 1990s, the astronomer Christian Nitschelm had discovered in old data that on November 10, 1981, for a few hours, the brightness of Beta Pictoris had decreased by 2% before returning to normal. Better, in the days leading up to the event, the star slowly shone more and more to fall at the same pace after the event. At the time, this is interpreted as the passage of the sphere of Hill and the planet in front of the star. Except that the event, noticed before the discovery of the first exoplanet, was never observed again. What to doubt the phenomenon that was originally. Before Beta Pictoris b got closer to her star, astronomers suspected she would not be in front of her record and would not cause a partial eclipse. That's how things happened. By adding the twelve observations made with SPHERE between August 12, 2014 and September 17, 2018, astronomers were able to reconstruct the trajectory of the planet. The result is incredible: in four years, he describes a bow that corresponds to his sight in orbit! It is clear that she could not pass in front of the star. Conclusion, if a planet is well responsible for the eclipse of November 10, 1981, it is not Beta Pictoris b. With the latest images of this giant exoplanet, Anne-Marie Lagrange and her colleagues have taken a new step in the exploration of the Beta Pictoris system. Indeed, thanks to the SPHERE instrument, they obtained the most accurate photographs ever successful of the environment of this star. The snapshot of November 18, 2016 reveals the planet while it is only 125 milliseconds of arc of its dazzling star. Reported at 63 light-years - the distance of Beta Pictoris - this gap represents around 2.5 times the Earth-Sun distance. This means that SPHERE can detect a giant planet only 375 million km from its star. In the Solar System, this corresponds to the orbits of the objects of the Asteroid Belt, between Mars and Jupiter. To give hope for future discoveries as it would be surprising that the system in formation of Beta Pictoris is rich only one giant planet. 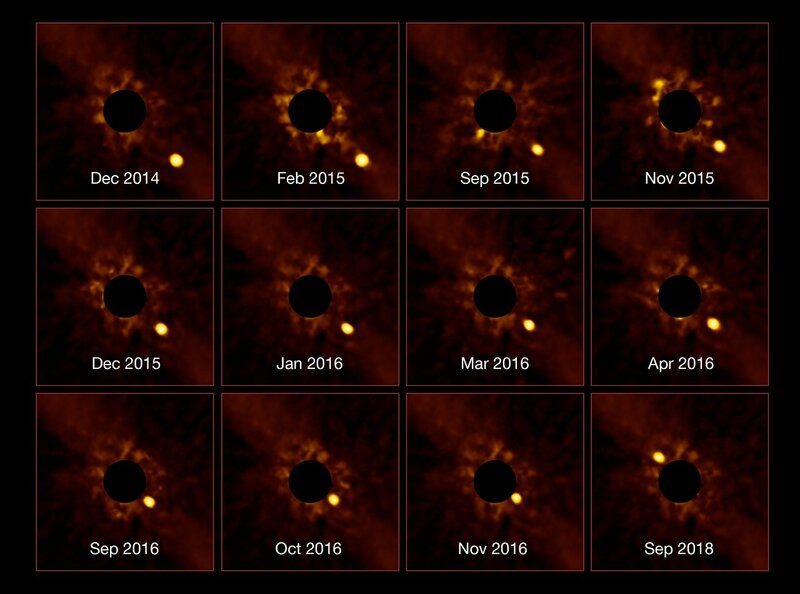 ESO's Very Large Telescope (VLT) has captured an unprecedented series of images showing the passage of the exoplanet Beta Pictoris b around its parent star. This young massive exoplanet was initially discovered in 2008 using the NACO instrument at the VLT. The same science team since tracked the exoplanet from late 2014 until late 2016, using the Spectro-Polarimetric High-contrast Exoplanet REsearch instrument (SPHERE) — another instrument on the VLT. Beta Pictoris b then passed so close to the halo of the star that no instrument could resolve them from one another. Almost two years later, after seeming to merge into the image of the star, Beta Pictoris b has now emerged from the halo. This reappearance was captured again by SPHERE. With all the Ultima Thule coverage, I forgot to check arXiv! We use a cross-calibration of Hipparcos and Gaia DR2 astrometry for β Pic to measure the mass of the giant planet β Pic b (13±3 MJup) in a comprehensive joint orbit analysis that includes published relative astrometry and radial velocities. Our mass uncertainty is somewhat higher than previous work because our astrometry from the Hipparcos-Gaia Catalog of Accelerations accounts for the error inflation and systematic terms that are required to bring the two data sets onto a common astrometric reference frame, and because we fit freely for the host-star mass (1.84±0.05 M⊙). This first model-independent mass for a directly imaged planet is inconsistent with cold-start models given the age of the β Pic moving group (22±6 Myr) but consistent with hot- and warm-start models, concordant with past work. We find a higher eccentricity (0.24±0.06) for β Pic b compared to previous orbital fits. If confirmed by future observations, this eccentricity may help explain inner edge, scale height, and brightness asymmetry of β Pic's disk. It could also potentially signal that β Pic b has migrated inward to its current location, acquiring its eccentricity from interaction with the 3:1 outer Lindblad resonance in the disk.